It is my personal belief that almost every photographer out there faces the decision at some point or another, of whether they should charge for their photographs turning a passion into their trade. If you have or are in the processes of making that choice, or if you already are working as a professional photographer, then VisionMongers is the perfect book for you. 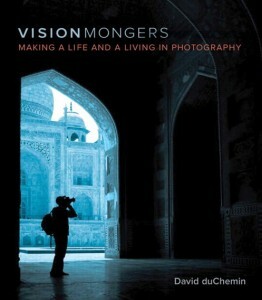 David duChemin is an accomplished photographer and author. When I reviewed his book “Within the Frame” I found myslef itching to go out and shoot within the first few pages and so with great enthusiasm I began VisionMongers. Truth be told… this book review is several months overdue. I wanted to consume the pages to their utmost depths before writing the review but life gets busy and it has taken me some time to get to the point where I can type this. I must apologize for that. Enough waffling, let me tell you about this book. VisionMongers is not a get rich quick from photography guide, it is also not a feel all warm and fuzzy, get up and go from page one inspirational guide to the profession that is full time photography. Instead the first half of this book (roughly speaking) is a reality check bringing the reader to terms with the business of photography, the risks and costs it will have not only financially but also to your craft, inspiration or vision. It is an essential base upon which to build and would help many people make a more informed choice when contemplating photography as a profession. Don’t get me wrong. I am not an advocate of shooting people down before they begin and I certainly don’t appreciate photographers who do that to people – particularly in their youth – and this book is not like that. The way this book is written is to give people a simple reality check and to tell the truthful tale of what a photographer’s life can be like. Once David has made sure that you understand the choice you are making he goes into the rest of the book as a guide to how you might succeed in your choice to pursue full time photography. There are stories of successfull photographers, guides on how to build your brand with tips on logos, websites, social media etc. This is the perfect resource not only for beginners but the seasoned pro who perhaps needs to relook at their stratergy. In conlusion I am going to go so far as to say that this book is an essential read that it should have a place on almost every photographers bookcase.